WASHINGTON — Now that we can look under the hood of the 2020 candidates' first quarter FEC fundraising reports, we're getting a better picture of how candidates are shaping their strategies — and what their limitations are. Among the Dems, there's Sanders, O'Rourke and then everyone else: We knew from early totals that Sanders and O'Rourke had put up big numbers, but the latest breakdowns show how those engines chugged along at a rate that far outpaced their rivals. Sanders raised about $445k in contributions per day during the 41 days he was in the race, and O'Rourke hit about $520k a day over 18 days. The next closest was Kamala Harris, who pulled in about $172k for every day she was in. Warren is making a big gamble on a big operation: Elizabeth Warren has spent the most of any Democratic candidate, at $5.3 million in the 90 days she's been in the race. By our count, she's shelled out about $1.2 million on 161 staff salaries, suggesting that she's planning to outhustle other contenders with a lot of resources on the ground early. She's still got a big chunk of money in the bank from her $10m transfer from her Senate campaign, but that high spending rate meant that she burned through more than 85 percent of her Q1 contributions. The question is: How long is that spending rate sustainable? Team U.S. Senate is staying above water — mostly because of their past campaign nest eggs: Of the senators running for president, all moved at least some reserves from their Senate accounts over to their 2020 war chest. But for Cory Booker, Kirsten Gillibrand, Amy Klobuchar and Elizabeth Warren, those were very substantial investments — ranging from about a third of their topline fundraising total (for Booker) up to three-quarters (for Gillibrand). Those transfers give those candidates healthy-looking war chests, but it's not because of great outside fundraising prowess. The exception, by the way, is Kamala Harris, who transferred about $1.2 million from her Senate campaign but raised an additional $12 million in other contributions. Buttigieg's lean campaign: It's striking how Buttigieg's fundraising took off as he gained name ID and buzz. He raised just $72,000 in itemized donations (donations of $200 or more) on Jan. 23, the day he announced his exploratory committee, compared with the million hauls of some of his competitors on their announcement days. (Of course, Buttigieg went on to raise more than $7 million more.) He's also spending very little so far, with a burn rate of under 10 percent and just about $200k spent on payroll and consulting. That means that he's got plenty left in the bank to compete on a Tier One/Tier Two level, but will have to start growing out his organization to compete on the ground. Tough news for Julian Castro: Yes, it's a crowded field, and it's hard to catch fire. But Castro, at a $1.1m haul, is being outraised by not one but two candidates who are basically unknown outside of niche constituencies — Marianne Williamson and Andrew Yang. What's more, Trump's latest paperwork shows that — for all the talk of how Democrats are playing the small-dollar fundraising game — he's still pulling in a lot of those under-$200 donations himself. By our math, small donations made up about 54 percent of the Trump campaign's haul. That pales in comparison to a Sanders or a Warren, but it's competitive or better than most of the other top-tier 2020 Democrats. It was a battle in the 2016 Democratic primary. It was a topic of repeated questioning in the run up to his announcement. But finally: We've now seen 10 years of Bernie Sanders' tax returns. 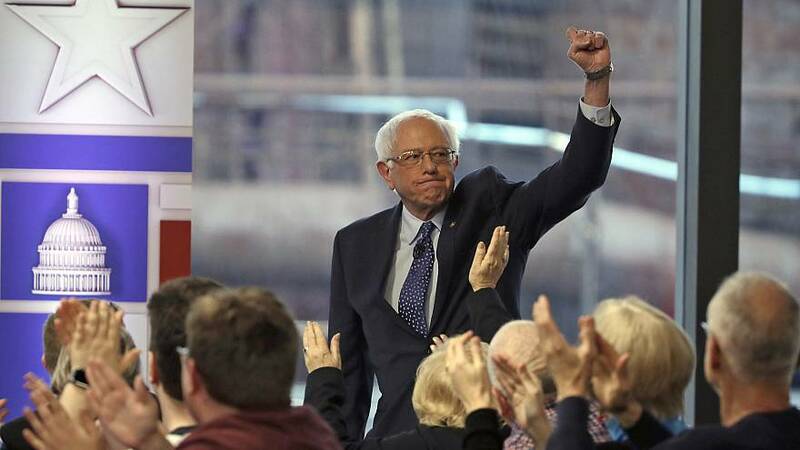 NBC's Shaquille Brewster reports that Sanders's total income, which previously came mostly from his U.S. Senate salary, "popped to over $1 million in 2016 and 2017, after he wrote 'Our Revolution: A Future to Believe In' in November 2016, raising his effective tax rate for those years to over 30 percent." Shortly before that release, he said: "They are very boring tax returns. No big money from speeches, no major investments. Unfortunately — unfortunately, I remain one of the poorer members of the United States Senate. And that's what that will show." Compare that with his defense — last night during a FOX News town hall— of the big payout from his book: "In my and my wife's case, I wrote a pretty good book. It was a bestseller, sold all over the world, and we made money. If anyone thinks I should apologize for writing a bestselling book, I'm sorry, I'm not gonna do it." Our question: Sanders has been resistant to this disclosure for years, which fueled plenty of speculation about what the returns might show. If the headline all along was just "we made money" … why did Sanders absorb all those questions rather than just make the release last cycle? Weld said in his announcement that Trump's "priorities are skewed toward promotion of himself rather than for the good of the country," and urged "a return to the principles of Lincoln — equality, dignity and opportunity for all." Joe Biden travels to South Carolina to deliver a eulogy for the late Fritz Hollings… Beto O'Rourke has a series of events in Virginia… Pete Buttigieg and Cory Booker are in Iowa… Amy Klobuchar has a health care roundtable in Florida… Elizabeth Warren holds an organizing event in Colorado… John Delaney stumps in New Hampshire.. and Howard Schultz tours the southern border in Nogales, Ariz. Some reading while you wait: NBC's Carol E. Lee, Hallie Jackson and Kristen Welker write that some of the more than a dozen current and former White House officials who cooperated with Mueller are worried that his report will expose them as the source of damaging information about the president. Data Download: The number of the day is… net 5 percent. That's former Alabama Supreme Court Chief Justice Roy Moore's net favorability rating among registered Alabama Republican voters in a new poll from Mason-Dixon Polling & Strategy. Part of that lead is due to Moore's overwhelming name recognition among Republican voters—two of his top potential challengers are unknown by about half of Republicans. But as Moore continues to flirt with another bid, polling like this won't dissuade him from doing so. And that could create another problem for the GOP. Don't miss the pod from yesterday, when we looked at how smart Americans think their own electorate is. The newly installed Interior Department Secretary is under ethics investigation by the agency's inspector general. House committees are subpoenaing Deutsche Bank and others as they investigate President Trump's finances, Reuters reports. The New York Times reports that the administration's sanctions on Iranian and Venezuelan oil may risk shocking the global market. President Trump panned Ilhan Omar as "disrespectful to this country" in an interview with a Minnesota television station after his trip to the state Monday. French emergency officials panned President Trump's suggestion to use "flying water tankers" to put out the Notre Dame Cathedral fire. The New York Times reports on how Bernie Sanders' Democratic opponents are struggling to stop him from winning the party's nomination. Beto O'Rourke released 10 years of tax returns Monday, the same day Sanders released his returns. Politico has a graphical breakdown of the Democratic presidential candidates' first quarter fundraising hauls.